When we were young children we took it for granted and didn't much notice it. Finally after three years at university, I came home during the summer that I became engaged to read Proust and only then did it strike me how very much in love our parents were. And by then I knew it wasn't the usual way married couples behaved. One afternoon I was hanging out in the kitchen. Mom had started dinner. I noticed her cheeks were pink, her eyes were sparkling and she had a little smile. She was close to the door when Dad came home from work. He took her in his arms, leaned her backwards, and gave her a long, passionate kiss. Coming out of it, they both were smiling. He took his uniform jacket off, put a large bath towel around his waist and they went into the kitchen togetherto finish dinner in perfect harmony. I realised that was the way he had always come home before we lived in Japan which was a year when everything was different. Their teamwork was so smooth that there was little room for us. As children we were given tasks like putting the applesauce through the food mill. We set the table and unset it and did the dishes but did little cooking. The cooking they did together was a public demonstration of their love for each other. As well, Dad's need to feed people with delicious food was his most open expression of love for others. I should now describe the applesauce. Wash unpeeled apples, roughly cut up boil up skin, seeds, cores and all together. Put through a foodmill which lets the applesauce pass through and sieves out the skins, cores, and seeds. Cooked this way the spplesauce is a warm, pinky brown. While it is still warm, flavour the applesauce with sugar, butter,cinnamon, cloves, ginger and nutmeg. Strangely this wasn't dessert. It was put on the table with cottage cheese, pickles and olives, bread and butter as a side dish in an ordinary meal in addition to the main components of meat, a green and a yellow vegetable and a starch. Then there was a dessert: cake or pie or pudding. Remember the punch made with Coolaid and fruitjuice. My favourite was grape Coolaid and pineapple juice. Does anyone still make punch the way we used to? I serve the applesauce for dessert with a lttle cream or ice cream. Now I will tell you why the Kellerman kids happlily ate their spinach when other kids hated it. They never served canned spinach, only fresh or frozen. Boil a couple of eggs. fry up some diced bacon, briefly cook the spinach, drain the liquid, stir through the crspy bacon and a little of the bacon fat, salt and pepper, slice the eggs and arange on the top of the spinach. Very beautiful and tasty too. Not so often we had creamed spinach and it was just as good. Now I challenge Edwina to post the browned butter carrots and Judy to post the perfect gravey. Betty and Jessie, Jeannie and Will what were the everyday foods that you liked best? Do you still make them? Did you teach your children? 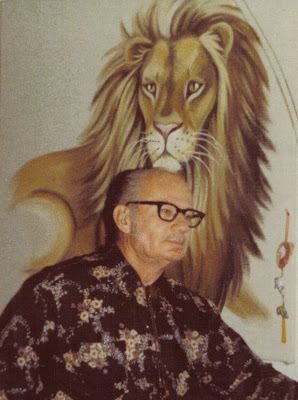 I grew up with that Aslan painting on the wall behind Grandpa. What a ride back in time. My mom loved the Chronicles Of Narnia back in the 70's. Who dosen't absolutely love Aslan? I barely remember the visit with Grandpa or where we were living then. Why is it that we don't remember everything about the ones we love? I'll have to write a blog on this very subject.